HR Solutions form the 3rd Pillar. During past decade, the role of HR has changed from being just an administrative department to a strategic function. Today, it is a well accepted fact that organizations grow because of people. People are the backbone of any business & HR is of the people, by the people, for the people! The HR department of any organization is a critical component, which takes care of the employee well-being. A structured and well thought-out HR facilitates achievement of business goals. Conducted numerous specialized assignments like HR Policy & Procedures Manual, Attrition Analysis, Psychometric Testing, Training Need Identification, HR Audit, Employee Satisfaction Measurement, etc for large corporates. 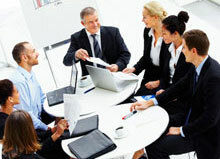 Successfully developed HR department in over 15+ organizations led to effective functioning of the businesses. Designed HR policies & procedures lead to unambiguous work culture. Well defined Job Descriptions & Organization Structure led to smooth workflow & goal oriented approach. Customized Performance Management System was well accepted & yielded positive results.